Open shelves filled with glass jars provide a fantastic-looking storage solution. Fill clear jars with dried beans, grains, or pasta for a rustic effect. Smaller colored-glass jars filled with herbs and spices are an attractive addition that also makes it easier to add zest to your cooking. A hanging pot rack is a storage option that also adds style. Hang your best-looking pots and pans above your stove so they’re always within easy reach while also adding a sense of height and drama to the room. Hanging racks are available in a range of styles and finishes, including wrought iron for a rustic look and stainless steel or chrome for a more modern, minimalist kitchen. 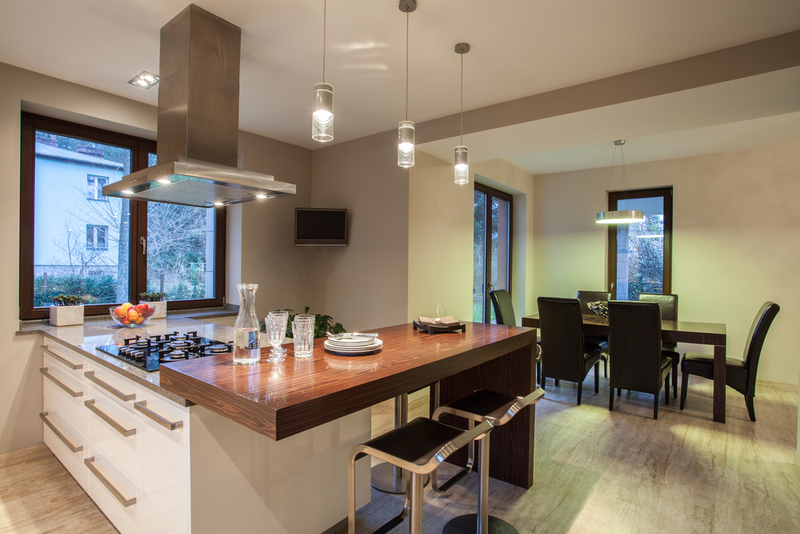 Under-cabinet lighting combines style and function. It eliminates glare from overhead lighting in small areas and adds atmosphere and interest. Choose strings of LED lights to provide a welcoming glow around the room, or carefully placed spot lamps to brighten murky work surfaces and gloomy corners. If you have a spare corner or length of a wall without installed cabinets, a baker’s rack is a decorative and practical addition. These impressive pieces of furniture offer a great combination of drawers, shelving, and hooks and can be a useful piece of extra work surface. Use them to display your favorite dishes and pans or your most attractive gadgets and gizmos that you don’t want to hide. Lastly, a kitchen might not be the place you immediately think of for hanging your favorite works of art; however, an extra touch of decoration can make a huge difference in the feel of this essential room. Food is perhaps the most obvious subject matter to use, but try painted scenes of nature to send your décor in a rustic direction, or photographs of cityscapes or pieces of abstract art for a more modern slant.